For the meal planning peeps among us, I know you have heard of Meatless Mondays. I applaud you for both sticking to one day a week without cooking and consuming meat as well as for planning out your meals. Meal planning is extinct in my household. I have the grandest of intentions quite often to plan out what Tolar and I will eat each week, but then this thing called life gets in the way and I give up on going to the grocery and just decide to order Noodles and Company for dinner. I mean their Penne Fresca is just too good to pass up! But I’m getting away from my point. Instead of Meatless Mondays, I’m offering you a meal that actually contains meat – and today just happens to be Monday. So here you go: Meat on a Monday. This is a super easy peasy recipe that Tolar and I love! I’m just your average Sandra Lee from Semi-Homemade. This dish freezes well, in fact, when I made this dinner last, I was making a big batch to freeze for dinners at a later time. Who knows I may pick up this meal planning thing after all?! Take the casings off of the sausage – this part is kind of gross, but imperative. 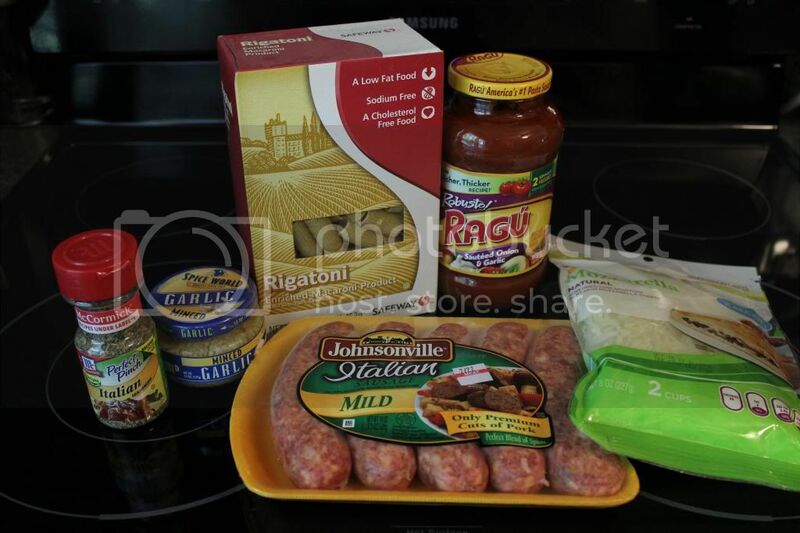 Then place all Italian sausage links in a frying pan, mash up like ground beef and cook until brown. 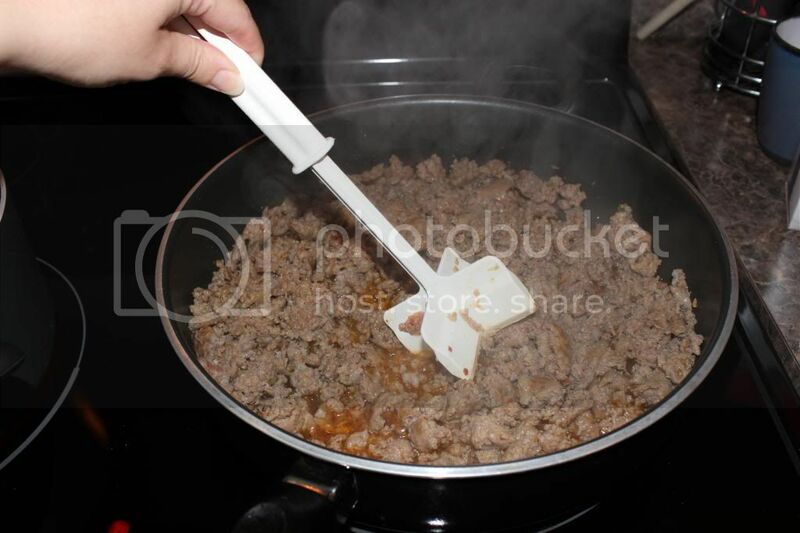 The sausage will get easier to mash as it cooks. In a separate pot, bring water to a boil and cook your pasta. 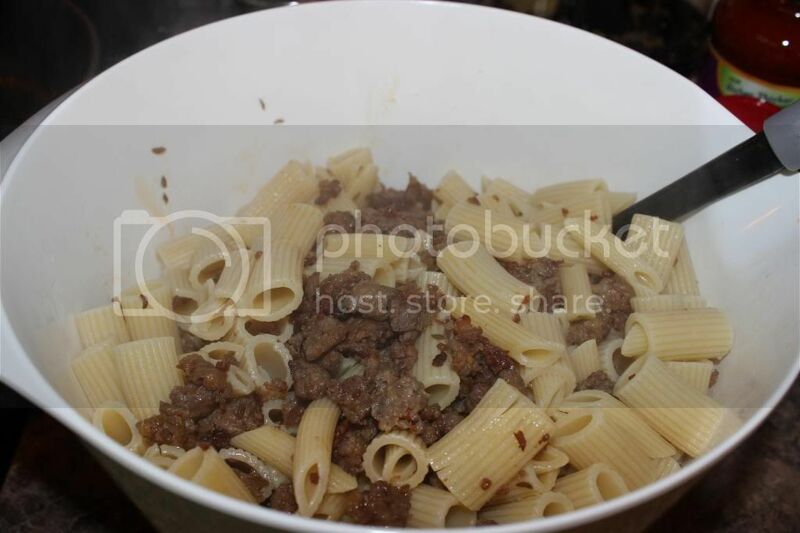 Once the pasta and sausage are cooked, drain the water from the pasta and the grease from the sausage and combine in a large bowl. Add in garlic, I like to add in about 4-5 teaspoons of garlic. 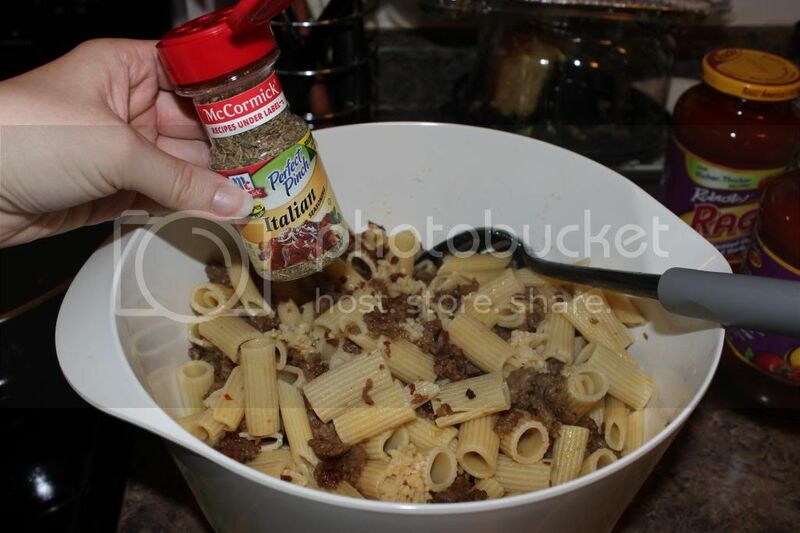 Then sprinkle in the Italian seasoning to your liking. Pour in about 1 cup mozzarella cheese and combine to mixture. Stir everything together. 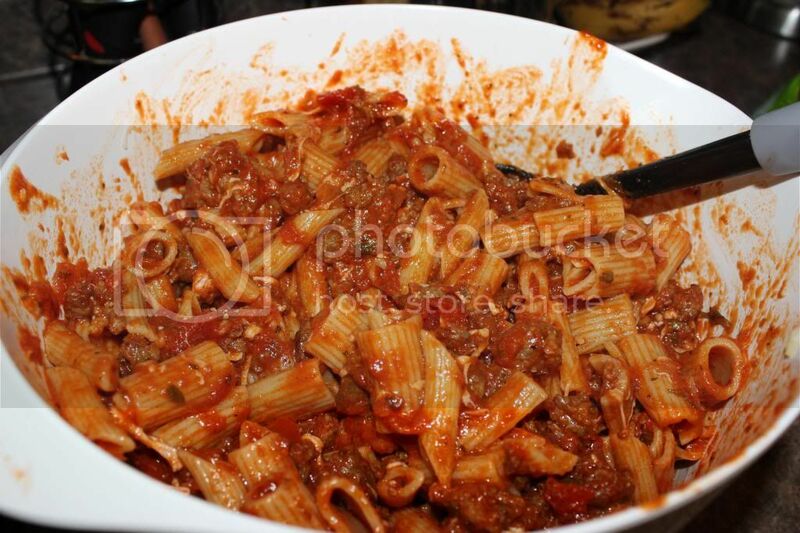 Pour your favorite pasta sauce into the bowl and stir until it coats everything completely. 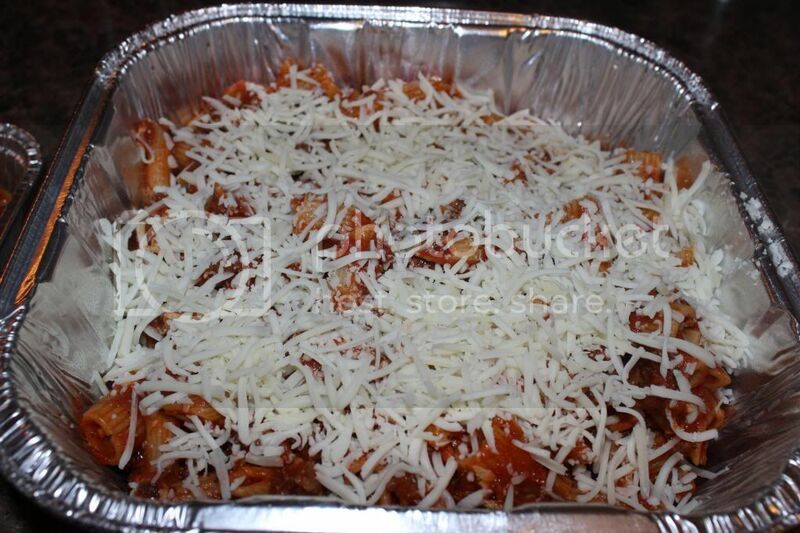 Place in baking dish (or a disposable freezer pan like I used since we will be eating this later!) and top with the remainder of the mozzarella cheese. 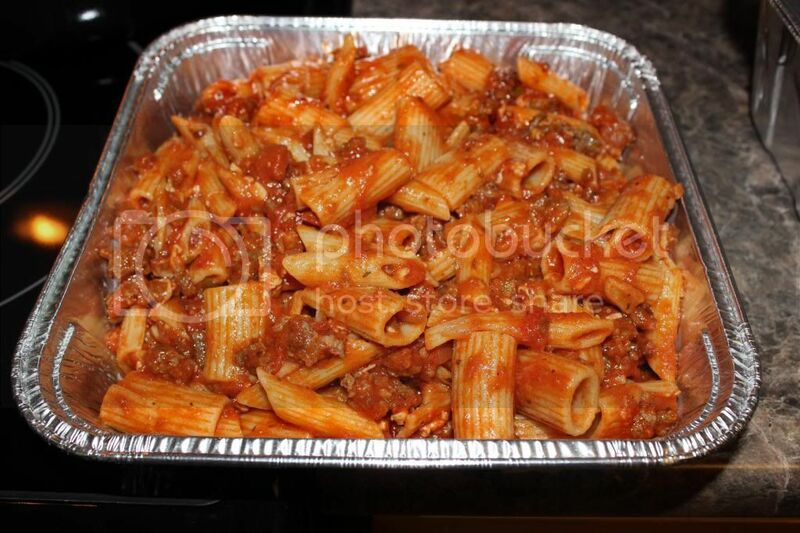 Finally, bake the pasta at 350 degrees for 20-25 minutes and enjoy! So there you have it! Yep, it’s not rocket science, but it is oh so good!!! Delish! How's new mommy life treating you?? I'm attempting a second life of blogging. :) Been missing you all!! If you ever want yummy recipes, let me know! I have some recipes for crockpots that are yummy (pulled pork is my favorite), and some that take a while to cook but then you can make a bunch and freeze it for REALLY fast meals as needed (turkey or beef Bolognese, tomato sauce, meat chili, black bean and butternut squash chili, ham and bean soup). They'd be great for a day you're home with the little darling, so that on days you're super busy, you pull it out of the freezer and have a meal as quick as you can defrost it! I'm going to make your recipe for my husband next week! ohhhh yum!!!! this looks so delicious! !